The AL-Series keyed leverset utilizes the Schlage original A-Series cylindrical chassis with stylish lever designs supported by heavy duty spring cages. The AL Series leverset provides strength and performance in the more abusive commercial Grade 2 applications. The leverset components such as threaded hubs and locking nuts literally "bolt" the lock chassis to the door to prevent loosening. A heavy duty spring cage utilizes compression springs to support levers from drooping. 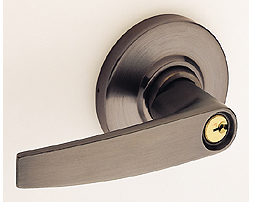 The leverset's interlocking spindle design gives internal strength to the lock when excessive force is applied to the lever while in the locked position. A patent pending design facilitates quick and easy adjusting for different door thicknesses. lever requiring use of key until button is manually unlocked. Push-button locking; pushing button locks outside lever until unlocked by key or by turning inside lever. The AL Series Leverset features heavy duty compression springs that extends the life of spring cage and provides smooth, fast return action of levers and minimizes drooping. The leverset is manufactured using cold rolled steel, machined, threaded hubs and locking nuts that prevents loosening of the leverset by bolting chassis to the door. 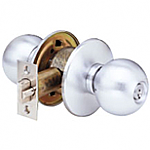 Heavy duty cast mounting plate with specially tapped holes keeps lockset tight on door. Large diameter of mounting plate and rose covers new ANSI hollow metal door cutout. A wide variety of designs, functions and finishes are available to match any architectural need. Most leverset styles and finishes match our mortise locks (L-Series), CM electronic locks, Von Duprin Exit Devices and LCN closers. Leverset Applications: Standard duty commercial exterior and interior doors for medical, office, hotel/motel, public buildings, religious, multi-family, retail/storefront and government facilities. Also available for heavy duty residential use. Meets or exceeds A156.2 Series 4000, Grd 2 strength and operational requirements.